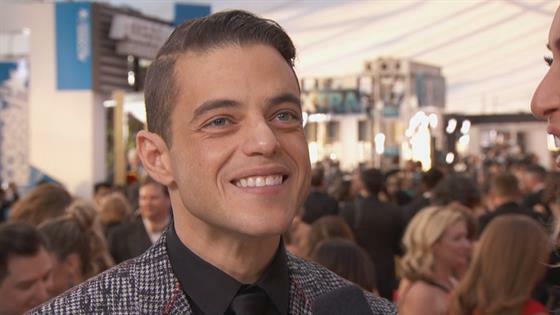 Rami Malek has become something of a fashion plate on the red carpet ever since he began racking up award nominations for his outstanding work on the USA series Mr. Robot, and on the red carpet at the 2017 Screen Actors Guild Awards, he revealed what he uses as inspiration for the choices he makes when deciding what to wear. And if the actor already didn't make you swoon, he just might now. "I think, you know when you're looking at pictures of your parents and you look back and you like, 'Oh, my dad looked really cool,'" he told E! News' Giuliana Rancic. "I just think, one day down the line, I want my kids to go, 'Look at him. He was rocking something out.'" Like we said, swoon. So, what was it about this particular suit? "I'm wearing Dior. This was designed by their designer Kris Van Assche," he said. "I saw it in one of the runway shows and said, 'Boom. Please send it.'" Of course, it's easy to do that when you're one of the new faces of the legendary design house. Should Malek take home the Actor for his work on the show, will his acceptance speech comes as easy? "I think about stuff to say all the time and I just go back in my head and say, 'That sounds ludicrous. Please don't open your mouth and say that,'" he revealed. "I think short and sweet, if you are fortunate enough to get up there, is the best way to handle these things. Throw a little comedy in there." Malek faces some stiff competition this evening, up against Sterling K. Brown, Peter Dinklage, John Lithgow and Kevin Spacey in the Outstanding Performance by a Male Actor in a Drama Series category.